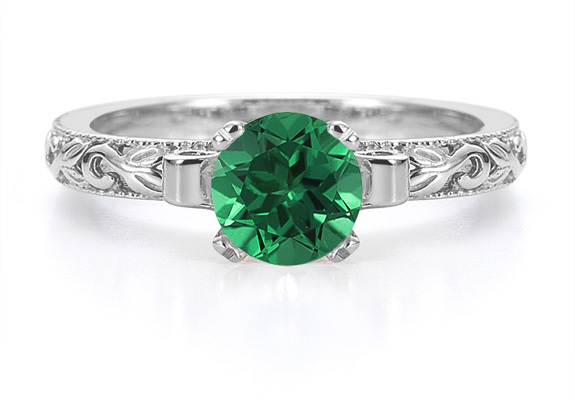 It's easy to bring life back into your jewelry collection with this art deco emerald ring from Apples of Gold. The 6mm emerald gemstone brings a vibrant beauty to the ring with its deep green color. The eye-catching stone is set in white gold and mounted in an art deco style setting which features two coils of gold to set the stone high above the band. Swirls and leaf-like shapes adorn the white gold band to complete the art deco inspiration. We guarantee our 1 Carat Art Deco Emerald Engagement Ring, 14K White Gold to be high quality, authentic jewelry, as described above.